In the autumn season, when farmers’ hard work comes to fruition, numerous communities celebrate seasonal customs related to harvesting. As the full moon signifies abundance and vitality, it is natural that this symbol’s meaning is amplified in the season of the harvest. For this reason, two holidays are held on the full moon: Baekjung, in the seventh lunar month, and Chuseok, or Korean Thanksgiving, in the eighth lunar month. Additionally, two ‘sevens’ on the 7th day of the seventh month and two ‘nines’ on the 9th day of the ninth month, Double Yang Days, have the strongest ‘yang,’ or positive energy, as two odd numbers are repeated. Jeongwol Daeboreum, a seasonal custom of the first full moon of the lunar year, chiefly celebrates the people’s wishes for an abundant harvest, but Chuseok in the eighth month is a celebration of gratitude, as the farmers begin the first round of harvesting. Consequently, the newly harvested crops are offered to the gods in appreciation. Also, the villagers’ hard work of harvesting is recognized, as everyone comes together to celebrate a joyful festival. These have become the key customs of the fall. The season of the fall consists of the seventh, eighth, and ninth months, by the lunar calendar. The major holidays during this time period are Chilseok and Baekjung in the seventh month and Chuseok in the eighth month. Seasonal markers include Ipchu, the Advent of Autumn; Cheoseo, the End of Heat; Baekno, White Dew; Chuboon, the Autumnal Equinox; Hanno, Cold Dew; and Sanggang, the Descent of Frost. Two of these, Chilseok and Baekjung, the major holidays of the seventh month, convey religious significance. Chilseok, on the 7th day of the seventh month,is the day for worshiping the seven sages, or Tathagatas, of the Big Dipper. Thus, Chilseokjae, or Qixi, and Chilseongjae festivals are held widely. Those, who celebrate, wish for peace at home and the good fortune of children. Moreover, during Chilseok Charye, Ancestor Memorial Services, participants offer newly harvested crops and fruits. During Yongshinjae, the Sea God Festival, participants used to wish for abundant yields at their rice fields. This holiday in particular not only has very strong Taoist characteristics, but also is as well-known for the love story of Jiknyeo, the daughter of the heavenly king, and Gyeonwu, a handsome herder. The story goes that they are only allowed to meet once a year, on Chilseok. The two join together at the middle of Ojakgyo, a bridge made by crows and magpies stretching all the way across the Milky Way for the couple. Baekjung, the full moon of the seventh month, is an important day for both Buddhists and the nonreligious. It is a relatively relaxed day during the off-season before fall begins. It is celebrated as a folk festival, as it marks the closing of the hard labor of summer farming as well as the end of the three-month-long summer meditation retreat of monks. Therefore, this day has been called by various names: sometimes the Washing of the Hoe or Farmhand Day. Farm music, called Putgoot, was played in some areas, and people joined together for an extravagant feast. 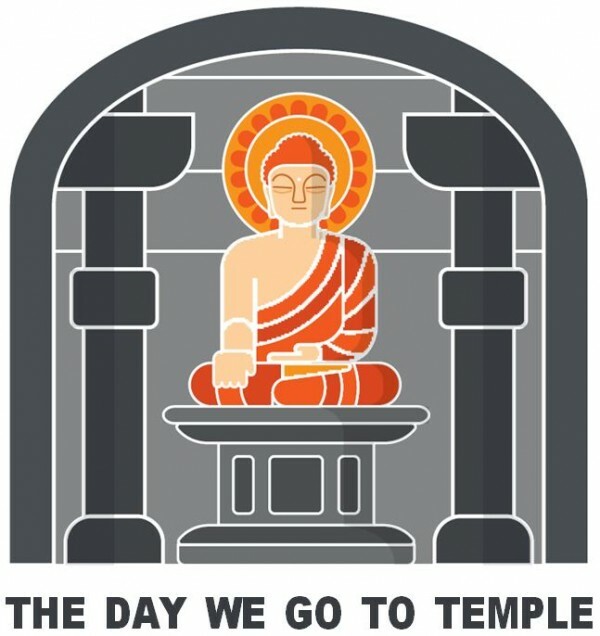 In Buddhism, it was also called Ullambana Day, which means ‘hanging down’ in Sanskrit. On the last day of the summer meditation, a popular ceremony was held, making offerings to monks, in hopes that this good deed would benefit the ancestors’ spirits, helping them attain blissful rebirth in the Pure Land in the west. Chuseok, or Thanksgiving, on the full moon of the eighth lunar month, is one of the two major holidays for Koreans, along with Seollal, Lunar New Year’s Day. The saying goes, “Do not wish for either more or less, just the abundance of Hangawi,” this is the day of celebration, giving thanks for the abundant harvest of the fall, prior to the actual time of fruition. Thus, multi-colored half-moon-shaped rice cakes called songpyeon are made from early harvested grains. These, along with various fruits, are offered on ancestral memorial tables. Most people also visit and pay tribute at their forefathers’ graves. Additionally, the origin of the female-centric custom of Ganggang Sullae, a traditional Korean circle dance performed by women under the bright full moon, can be traced back all the way to the earliest ceremonies dedicated to the heavens. Dalmaji, making a wish in the moonlight is a kind of intangible historical cultural heritage tradition, holding within it the innate sentiments of the Korean people. The 9th day of the ninth month is called Junggu or Jungyangjeol; that is, Double Yang Day on the lunar calendar. Along with the 3rd day of the third month, this day in particular is filled with the strong yang, or positive energy. For this reason, people follow a number of customs. It is also said that swallows return from their winter migration on the 3rd day of the third month. Consequently, people go out to enjoy flowers and nature on the 3rd day of the third month and the changing colors of the leaves in fields and mountains on Junggu. During the Joseon Dynasty, tests for Confucian scholars were held on the 3rd day of the third month and the 9th day of the ninth month. First place recipients were customarily awarded with privileges. The tradition of Jungyangjeol was widely practiced from the periods of the Silla Dynasty (57 B.C.–935 A.D.) to the Joseon Dynasty (1392-1897) but its meaning has diminished significantly over the years to become simply a lucky day, rather than a holiday. However, the tradition of Darye, a memorial service in the form of a tea ceremony for the Buddha, bodhisattvas, the gods of heaven and earth, and ancestors, is still observed. Records indicate that Venerable Chungdam of the Silla Dynasty made a tea offering every 3rd day of the third month and 9th day of the ninth month to the Maitreya Triad of Samhwaryeong Ridge on Mt. Namsan in Gyeongju City, which was the capital at that time. Thus, we can see how deeply rooted the tradition of Darye has been on Jungsam, Double Three, and Junggu, Double Nine. Moreover, the Chunhyang Festival in the spring and Chuhyang Festival in the fall are celebrated as seasonal ceremonies for ancestors. Particularly, on Jungyangjeol, many people carry on the tradition of holding Cheondojae, a consolation ceremony for the spirits of the dead in Buddhism: those whose ancestors’ dates of passing away are unknown; those without any children; those who were killed in battle; and those who were taken unfairly from this world. Seasonal markers, according the solar calendar, include Ipchu, the Advent of Autumn, on the seventh of August and Cheoseo, the End of Heat, on the twenty-third. On Ipchu, marking the beginning of fall, the late heat wave is persistent, but as cold air starts to blow, people begin to prepare for the fall. During this period, people sow cabbage and radish seeds for Kimchi making, getting ready for the coming of winter. Cheoseo is the season when the summer heat starts to fade. As we pass Cheoseo, the saying goes, “Even mosquitoes lose their bite.” Mosquitoes’ strength weakens, the blaze of the sun subsides, and the grass no longer grows. As in Chungmyeong, the season of the Clear and Balmy Days, after Ipchun, the Advent of Spring, the sky clears; likewise, in Cheoseo, the End of Heat, after Ipchu, the Advent of Autumn, the weather becomes clear, so many people follow the custom of drying clothes and books outside, which had become moist from the summer humidity. In September of the solar calendar, Baekno, the Time of White Dew, takes place on the eighth and Chubun, the Autumnal Equinox, is on the twenty-third. On Baekno, dewdrops form on leaves, and autumn’s presence can be felt in the air. As it is the season when many grains and fruits ripen, the quality of the harvest depends on the weather. It is believed that if this time is accompanied by strong sunlight, there will be a good harvest; if it rains, grains will be less ripe, and the sweetness of fruits will diminish. On Chunbun, the Spring Equinox, and Chubun, the Autumn Equinox, the lengths of day and night are the same. Chunbun is the point of building of yang, or positive energy, and Chubun is the start of the strengthening of the yin, or negative energy. It is said that ancient people regarded the measurements of ‘do’ (degrees of temperature) and ‘yang’ (degrees of energy) as equal; the scale of ‘hyeong’ and ‘seom’ as even; the volumes of ‘du’ and ‘tong’ as exact; and the weights of ‘kwon’ and ‘gae’ as straight during Chunbun and Chubun. The word ‘kwon’ refers to weight on a scale, and ‘gae’ as a tool of measurement. As the length of the day and the night are the same, the measurements of length and weight are standardized during this time of the balanced energy of yin and yang. Hanro, the Cold Dew, takes place on the 8th of October, by the solar calendar, and Sanggang, the Descent of Frost takes place on the 23rd. Hanro is when cold dew forms. By then, as grains ripen and fruits reach their heights of sweetness, the harvest begins and hibernating animals reserve as many nutrients as possible in their bodies in preparation for the coming of cold winter. On Sanggan, it gets so cold that the frost descends. This is the last seasonal marker of autumn. With this day, the harvest is finished, and the preparations for winter begin.